Claim to fame: of the US routes that were ever actually signposted, US 102 was the first to be decommissioned. (Four other routes were decommissioned before US 102, but they were never posted in the field). 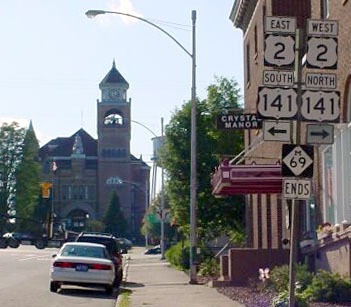 US 102 was among the original 1926 routes. 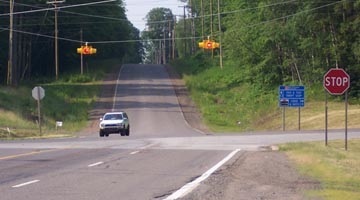 Its north end was at a junction near the current north end of US 141 (maps, photos, and more info on the Covington page). Today southbound US 141 turns left with eastbound US 2, but originally that was southbound US 102. It may have ended at that junction, or else it overlapped to the left (east) with US 2, ending in downtown Crystal Falls. It was 1928 when US 141 was extended north from Green Bay WI, and its northernmost segment assimilated US 102. Thus US 102 acquired the dubious distinction of being the first US route to be decommissioned -- only about one year after the US routes had been signposted in Michigan! It was a good move, though: US 102 was a tiny north-south route with an east-west number. So when US 141 took over, everything made more sense. last updated June 23, 2016.